On this edition of the “Big Band Files” we salute baseball with some of the great moments in play-by-play along with songs about the game. Voices include: Ernie Harwell, Curt Gowdy, Red Barber, Vin Scully and Jerry Doggett. You’ll hear Jerry Doggett call the final inning of Sal Maglie’s no-hitter in a vintage 1956 radio broadcast and Vin Scully will do the postgame recap. 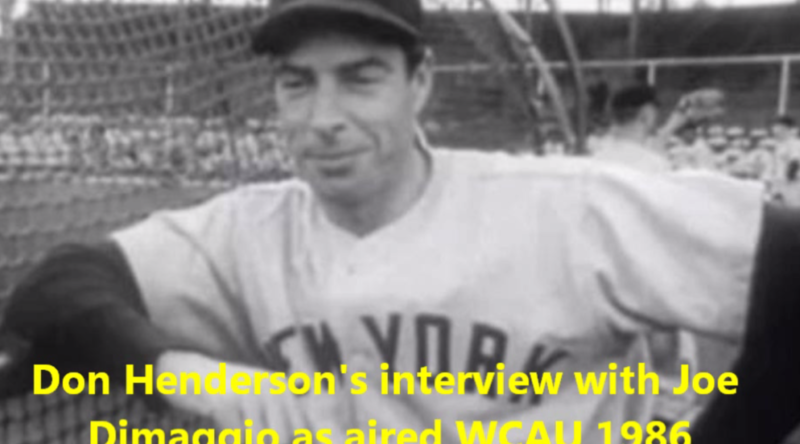 You’ll also hear a rare interview with Joe DiMaggio by my co-host on “Sports Talk” Don Henderson. Songs include: Talkin’ Baseball, I Saw it on the Radio, There Used to be a Ballpark, Van Lingle Mungo, Baseball Blues, My Wife Saw the Dodgers Play at Ebbets Field and more. On this opening week of the baseball season, this episode of the “Big Band Files with Doug Miles” features some songs about baseball interspersed with classic audio featuring the voices of the game. (Originally aired WSRQ radio 2010). Don and Doug are taking this week off for Thanksgiving. Here’s a classic interview Don did with the great Joe DiMaggio on the Phillies radio network (WCAU) back in 1986. Happy Thanksgiving! “Sports Talk” co-host Don Henderson’s interview with the great Joe DiMaggio during a rain delay as aired on the Phillies Radio Network 1986.